I spent the weekend in Oklahoma and returned to Houston today. It was pretty much a last-minute decision. Every Wednesday United Airlines comes out with a list of “cheap fares” for the upcoming weekend. Last week Tulsa was on the list, so I called Vicki and asked/told her that I was coming up to help. I can’t remember if I wrote about this or not, but when she had surgery after she broke her leg very, very badly, her foot basically had to be re-attached to her leg. You know, with metal plates and screws and fun stuff like that. As difficult as this might be to believe …… the surgeon attached it at an angle. When she would put her legs out in front of her straight, her knees would both point up, as would her left foot. But her right foot was turned outward …… which was a little freaky to see. Her surgeon didn’t think it would be a big deal, but she (and everyone else in the world, especially HER world) disagreed, and encouraged her to make an appointment to tell him that she wanted it fixed. Which also meant that the weeks she had spent going to/working at physical therapy, were a complete waste of time. But, she had a second surgery a week and a half ago, and now she’s back to square one. No weight bearing on that foot for at least three more weeks and then hopefully she can start PT. She may still be using a walker/wheel chair at Christmas. But hey, at least her right foot is on straight. The first time I went up to stay with her and help out (about 2 weeks after the first surgery), I walked into her house and she came out of her bedroom, using a walker. I looked at her and said, “You know, I knew that this day would come …… I just didn’t expect it to come for another 20 or so years!”. And though she was unable to walk, we really did have a great week. As we did this time (only it was less than 9 days this time …… and only about 3). Both times I was the chauffeur for her and her lovely 12 year old daughter. I also helped with the house, the laundry, dishes, etc. Nothing spectacular (except helping her organize her jewelry and board games cabinet …… and you know how much I LOVE to organize! ), just the every day kind of housework things. Oh, and I made great margaritas. But we also spent time just sitting and talking …… both times. I got there Saturday afternoon, while her family was at OSU for the football game that evening. She and I watched, and loved, that game. GO COWBOYS!!!! People have been very nice and have brought the family dinner a few times a week, which is so wonderful when you’re off of your feet, or just had a baby, or are in shock from grief. It’s nice to not have to have to think about what to feed your family because someone wonderful brings all of you a warm meal. Or almost all of you. I told her that I was going to blog about this, because I find it hilarious, and a bit stunning. When I was there the first time, this little old lady from their church brought dinner over one afternoon. She didn’t stay to chit chat, nor even acted like she wanted to stay, but she told Vicki what she had brought for dinner. She had made chocolate chip cookies. Ummmmmm, ok? And thank you very much? She and her grandson took the food into the kitchen and put everything on the counter and then left. I let them out the door, since Vicki was stuck in an office chair (it had wheels so she could roll around the house). Then we both walked/rolled into the kitchen. The woman had made a roast with vegetables. A roast that she got out of Vicki’s freezer, then took home and cooked. Yep, your eyes are fine. 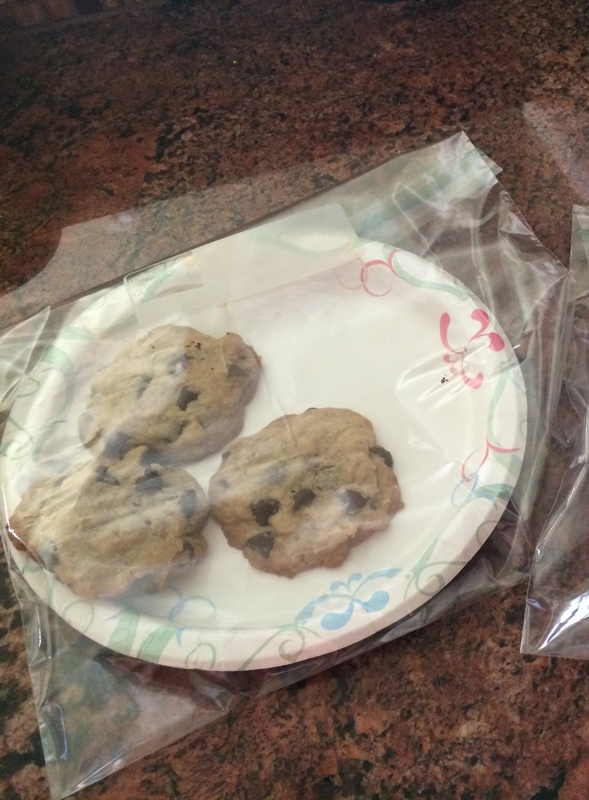 Yep, there are only 3 (THREE) cookies in that bag. There are four people living in that house, and I’m not one of them. That sight was the most hilarious thing I’d seen in a long time. And it was made more hilarious by her pointing out that SHE had made those cookies. When you make a meal for someone, do you make a recipe and then only take about an eighth of it to the person’s house?! It was just soooo funny. To be fair, the woman also brought three small chocolate chip muffins. Which really doesn’t change anything. And yes, it was very nice of her to make dinner. But it was still hilarious. Fortunately they’re still getting dinners. And Sunday they got an entire 9×13 pan of brownies. Do you notice how similar they look when they’re face down? 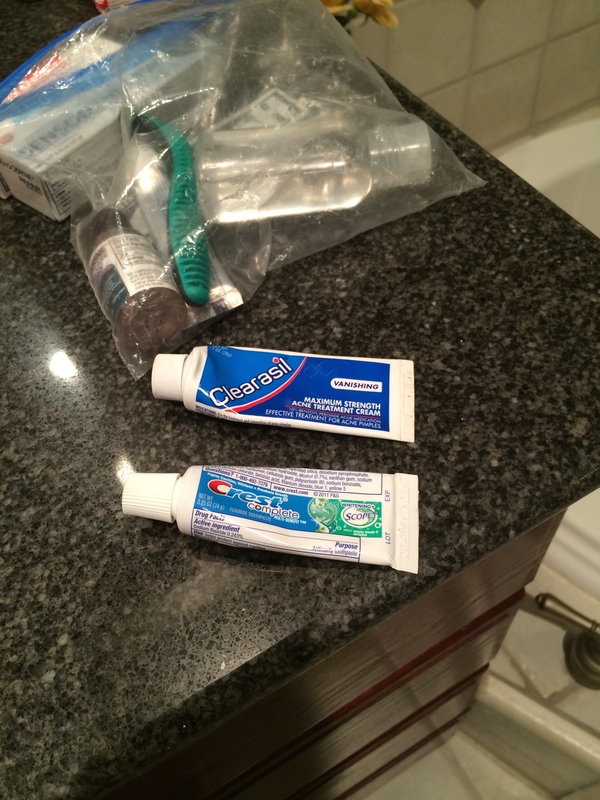 Yeah, well, they’re not so very similar when you brush your teeth with the wrong one. I’ll pause while you laugh. And I hope that you pee your pants. Yes, I brushed my teeth with Clearasil. Or rather, I started brushing my teeth with Clearasil. It didn’t take very long to realize that Crest was not in my mouth. In other news …… this time Thursday, I’ll be in NY!!!!! Can you tell that I’m just a teeny bit excited? And even better, I really don’t have much packing to do! I’ve packed one empty suitcase inside another empty suitcase. All of my fall/winter clothes are in NY and I need to bring some back. Other than that, I’m taking my Tulsa suitcase and it’s still packed. This means that I can spend time binge-watching “The Black List”! It’s SO good. I didn’t watch it last season, though I wanted to. I always have problems watching shows consistently. Especially shows that you should watch each week to understand. Maybe it’s a commitment issue. So thank goodness for internet, Netflix, and network sites that allow you to watch their shows. It’s now after midnight. I need to go so that I can finish the latest binge. I think I’m on episode 8 or 9. I may have to start it over since it’s been well over 12 hours since I started it, and I couldn’t figure out why it didn’t look anything like the end of the episode before. Nor did it explain why. One minute/end of an episode someone’s getting shot in the head, the next minute/start of the next episode the setting is completely different and everyone who was captured by bad guys, are no longer captured. That may be another reason that I didn’t watch it during the season. Which really doesn’t need any more frying. And be sure to make certain that it’s toothpaste you’re putting on your toothbrush. This entry was posted in Life After Loss, Moving Forward and tagged Hope, life after loss, Living, widowed on September 17, 2014 by mysecondplana. Well, look on the bright side. At least your teeth won’t have zits! 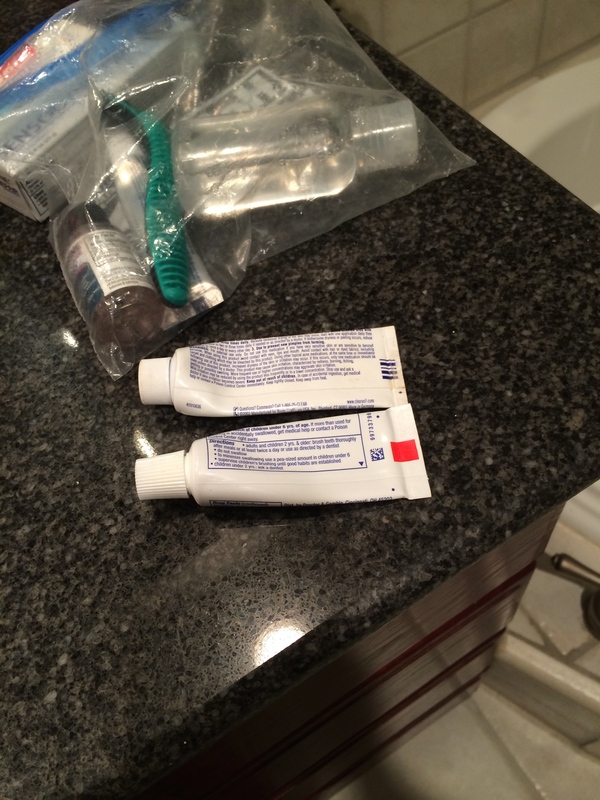 I did that with A & D ointment…yeah, don’t ask. And thanks for letting me know that I’m not alone. Ugh, The “reattaching” of the foot reminds me all too well of when my husband’s foot had to be reattached. Fortunately, his surgeon did not need a second try. However, he came out of the operating room and told me (I will never forget this) “it’s a good thing I like puzzles” Um great. That’s the reassurance I want. The background for your amusement is my husband was at a work team building event…bowling. He fell and shattered his ankle. This is what led to his two plates and multiple screws. So I sympathize with your friend. And I feel for you helping take care of her. I was exhausted after 6 weeks of taking care of him.